If like many shooters you’ve noticed the increase in not only ammunition prices but in the price of all guns you may be looking for a less expensive alternative. This Taurus Model 66 may well be a good alternative for many of you. 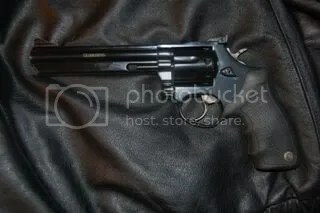 This is the Model 66 .357 magnum. The frame size is the same as the S&W model 686 and like one variation of the 686 is a seven shot revolver. The speedloaders for the 686 also fit the model 66 Taurus. This revolver was slightly used and was purchased for $270. The previous owner fired only 14 rounds so I would realistically consider it new. The sights are of the Millet type rear with a standard ramp front sight. 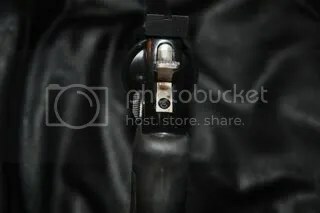 The way the top strap is constructed is almost identical to the Colt Python in shape. I would say this is for the purpose of added strength. The trigger is slightly wider than the usual variety and has a smooth surface that is curved for a more comfortable feel. At 40 ounces this is no lightweight by any means. However this would make an excellent weapon for home defense as well as hunting. If I were to consider this revolver for home defense I would most likely add laser grips. As far as concealment is concerned unless you are 6 feet 5 your only choice is the use of a vertical shoulder holster. I have tried concealing this big boy in a shoulder holster a good friend gave me and honestly it works fairly well under a jacket that doesn’t fit to snug. Of course drawing a six inch revolver in a hurry takes considerable practice. It certainly is an intimidating weapon. The most important question is this a reasonable choice for a concealed carry gun? No not really. Can it be done of course but I would certainly prefer a good 1911 or the H&K USP compact as far as the guns I own. If a revolver is the way you like to go for a concealed carry gun then a previously reviewed revolver like the 3 inch barreled S&W model 64 or 65 would be ideal. When comparing the Taurus to the S&W action the transfer bar is the most obvious difference. When you remove the side plate and compare the internals there is very little difference between the two. The way the trigger operates as well as the method the cylinder rotation operates is also almost identical. It does use a coil spring rather than a leaf spring as S&W does. It actually seems to be a blending of S&W with a little Ruger built in. The action is a sturdy build. The rest of the gun is also well made and has a very good cylinder lockup. The trigger feels more like a Colt in that you need to pull the trigger straight through rather than being able to partially pull the trigger like a S&W. The trigger pull in double action is nice and smooth as is the single action. Previous Taurus revolvers were really nothing to get excited about. The quality and design features have undergone significant improvement in recent years. The best example is the Taurus 1911 which has also been reviewed on the blog. I have to give Taurus credit they are making a quality product throughout the line. Where you used to see very few Taurus guns in dealers cases that has changed. Most every dealer you visit now has a pretty good selection of Taurus guns both revolver and 1911’s. The snub nose revolvers seem to be the most popular after the 1911. I know many people think that Taurus guns are just cheap copies of S&W’s. At one time this may have been true but no longer. You really do get your moneys worth with these guns. 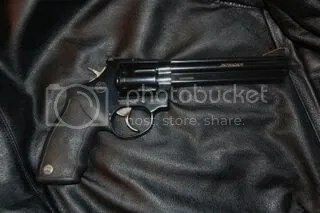 Are Taurus guns as good as S&W’s. Not really but it doesn’t mean they are inferior just different. They also have a lifetime warranty. Is customer service up to par with some other companies? Well from what I’ve heard no it’s not. Time to have a repair done seems to be the biggest complaint. Personally I have never been big on warranty coverage. When you get right down to it most problems you encounter are rare and fairly simple to remedy. Shooting the Taurus is pleasant even with some pretty hot loads. The grips that come standard on this model soak up recoil well. Also the full lug barrel adds enough weight to dampen recoil and allow for less muzzle rise getting you back on target quickly. I normally shoot most of my handguns from about ten yards when doing a review but with this particular gun with the six inch barrel I started at 15 yards and moved back to 30 yards then finally 50 yards. From 15 yards it was almost effortless to keep seven rounds into one hole of about 1 1/4 inch. Moving back to 30 yards I fired four cylinders and maintained a group of 3 inches with one called flyer. All rounds were fired from the 30 yard line single action. I did have to adjust the sights a bit from the factory setting at 30 yards .I moved back for my last round of shots to the 50 yard line. After firing another four cylinders I managed to keep all my shots within the 5 inch target. All in all I found this revolver to be pretty accurate with a good trigger and an overall very good value. Anyone in the market for a good target revolver to shoot at extended distances or for hunting use would do well to consider this Taurus. It’s always fun to test your skills with a revolver at distance! This entry was posted on February 25, 2008 at 8:16 pm	and is filed under Taurus Revolvers. Tagged: Taurus, Taurus Revolvers. You can follow any responses to this entry through the RSS 2.0 feed. You can leave a response, or trackback from your own site. You hit the nail on the head. A good gun, a good value, and mine shoots excellent. Heck I love it! Thanks! I sure like mine as you can tell. This is my second Taurus. I bought the 1911 first then this model. I just bought a Millennium Pro PT111 in 9mm today. I’m going to write up a review of it in the next few days. It has a wonderful trigger you would not believe. Anyway, you can’t beat a six inch revolver for accuracy and just all around use. Geez I’ve never heard of that happening with a Taurus revolver. What type of ammo were you using? Did the top strap curl back when it blew? I hope you didn’t get hurt. I’m also glad they are sending you a new model of that revolver. By all mean please send some pictures of it I’d like to see what it looks like. I recently purchased an older version of the Model 66 from a local pawn shop. I read Jack Kents account of his Taurus exploding and now I have concerns. If you have any comments to ease my mind I would like to hear them. Also, my 66 has standard checkered wooden grips and I hate them. 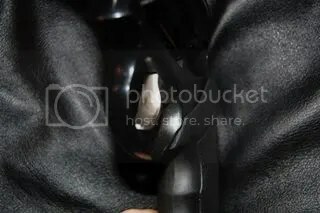 Could you guide me to a location who sells the newer style grips at a reasonable price? This link will give you all the grip shapes and types of wood. Many different size grips also for assorted hand sizes. Another way to get some pretty nice grips is to check ebay. Granted some are very cheap and not worht having but if you dont mind used grips you can find some nice on es for little money. As far as blowing up is concerned. I don’t know the person who made that statement but the usual reason for a revolver to blow is a defective factory round and yes it does happen or a handload that has been pushed way to far. Some reloaders will load a 357 round meant for a gun like a Ruger single action which has the ability to handle much higher pressures. The Taurus is a good revolver and this is actually the first time I have heard of one blowing. Granted a Taurus is not a Smith & Wesson but it is a good revolver. Mine has had about 2000 rounds through it with no problems whatsoever. I estimate that half of these rounds were 357 and half 38 specials. I check the specs on my revolvers about once a year to ensure all is well. Mine is still in great condition which says something for the quality of the gun. By the way for any medium frame revolver it’s always better to practice with 38’s to make sure the gun last longer without having any service on it. You have a good revolver enjoy it! I have owned both the Taurus M66 and the S&W 686 and I believe they are very comparable. I have noticed that most of the people who criticise the Taurus M66 have never actually owned one! My M66 had a rough action on one cylinder, but that smoothed out after about 400 rds. Both revolvers shoot much more accurately than most humans, so its hard to tell any practicle difference. I agree that the factory grips are very good; a lot like Pachmayr grips. The Taurus M66 is a great value! I agree and you spend a lot less to! Your’e right most people who knock them never even held one much less shot one. They just repeat what they hear on some forums! They have changed the type of steel since you got that one. It’s a stronger more duable type now that will hold up to more of the heavy loads. Glad yours has given such great service! It sounded a little high to me so I checked Gunbroker which if your not familiar with is a gun auction website. They have a stainless listed with a buy it now price of $395. Once you join this website you can purchase a gun and contact the seller and have it transferred to your local FFL where you purchase it as normal as far as paperwork is concerned. naturally you pay the seller at the time you commit like any other auction site. This is one other way to purchase a gun at what is usually a lower price. Now from a retail seller this is probably not that nad a price. You have to keep in mind that there are fees to buy online which will add up to $50 average. http://www.laserlyte.com/Laser_Gun_Sights/Quick_Detachable/FSM-00QD-140.html This compact one may work on the rail lug under the barrel which would be the best if it will fit. Please let me know what you decide on and how it works out. I did call all the above companies to get the info I passed along. I need rings to mount an optical sight to my Taurus mod 66 revolver. Can you help? Sure, if you go to the blogs main page you’ll see a Mounts Plus logo. Just click on that and it will take you to their website where you’ll be able to find mounts for your Taurus. 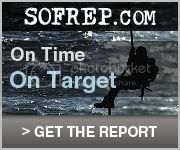 You can also give them a call for help on the type of mount needed for your optic. Gunner, you mentioned that the M66 revolver has undergone a material change to a heavier steel. How do I determine if an M66 I’m looking at was made using the heavier steel? I’m considering buying this one off of jetguns http://www.jetguns.com/taurus-p-2840.html Thanks! The only way to really know is to contact Taurus USA at http://www.taurususa.com/contact.cfm and provide the serial number. From there it should be easy for them to let you know. Of course with this one being a new gun it should be one of the improved models. what is the value of this gun now? I have the Taurus Model 66B6 and mine was manufactured in 2003. I purchased it in 06/05. I have fired .357 Magnum and .38 Special through it always factory rounds, never reloaded or +P. I did fire a round with steel or aluminum shells these stuck in the cylinder foe some reason. I fire only the brass shells from now on. I believe the person who had his blow up is ok. After not using it for ten years he should have cleaned it first and maybe have taken it to a gunsmith just to make sure and get a professional opinion. He then should have used only factory rounds as per Taurus recommendation. Reloads and extra pressure rounds are not to be used as far as Taurus is concerned. It’s good that they would replace the firearm though.